This beach ranks #3 of the "Best beaches in Santa Marta"
The cost of a good beachfront hotel starts from US$50 per night for the room. There are also some cheaper options, but these are often not available for the online booking. Please note that a 15-minute walk from the beach there is Palomino village itself. It has much more accommodation options, while the prices are cheaper. Fly to Cartagena international airport (CTG). Next take a bus (with a connection stop in Santa Marta) or hire a taxi. 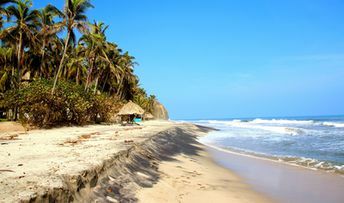 Palomino beach in Colombia is suitable for a holiday any time of year, because there is no pronounced rainy season, and it is always warm. It is best to surf during the windy period from December to April. As for a pure beach holiday - choose a quiet period from May to November.